The Australian quartet’s sound and aesthetic do have clear precedent: the early-’00s pop-punk boom, when Good Charlotte, Simple Plan, and New Found Glory made Top 40 inroads. This is no coincidence. 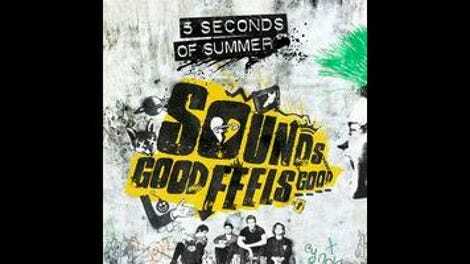 Sounds Good Feels Good, 5SOS’ second studio album, was produced by pop-punk svengali John Feldmann, who’s helped shepherd the genre’s mainstream evolution (and the ascent of 5SOS) for years, while Good Charlotte principals Benji and Joel Madden have multiple co-writing credits. The Madden-assisted songs also represent some of Sounds Good Feels Good’s best tracks: The sassy, underdog rallying cry “Permanent Vacation” hints at Green Day’s new-wavier shuffles, while the glammy bubblegum-pop “Hey Everybody!” interpolates some of Duran Duran’s “Hungry Like The Wolf” as it encourages those down on their luck to keep their chin up. The strutting “She’s Kinda Hot” even sounds like the result of late-’90s Sugar Ray becoming sentient. Although this ambition is admirable, Sounds Good Feels Good’s more serious moments aren’t always successful. The second half of the album loses steam as it becomes more horizon-expanding, with the subdued, acoustic rumination “Invisible” and the sprawling final track, “Outer Space/Carry On,” in particular dragging the energy down. This is more a function of growing pains than anything else, a relatively new band stretching its songwriting scope and not quite hitting the mark. Still, the album’s positive outlook is infectious. Its underlying message is that life is precious, and enjoying what you have (and not taking things too seriously) is important. Hard times are merely temporary, and even heartbreak is a mere blip on the continuum. Sounds Good Feels Good certainly won’t appeal to everybody, and it’ll likely irk pop-punk traditionalists or anyone with a bias against teen-oriented music. But that’s actually kind of the point. During “Permanent Vacation,” the band tosses off a bold true statement: “We’re the voice of the new generation.” Overall, 5 Seconds Of Summer puts a contemporary spin on early-’00s mainstream pop-punk by avoiding the kind of self-pity, hopelessness, and subtle misogyny that sometimes dogged that nascent scene. More importantly, Sounds Good Feels Good never condescends to the band’s core audience of young female fans. If anything, it feels especially directed to these converts, a reassurance that the band is challenging itself musically precisely because it respects the intelligence and curiosity of its followers. That’s no small gesture—and to fans, it absolutely means the world.